"Mum, where is the other side of my shoe?" "No, they are the same side. Look." I took a look and I laugh out loudly. True enough, DinoBoy was holding on to 2 left side shoes. How in the world did I managed to do that??? If it was normal school day we will be facing a catastrophe of some sort but luckily its Youth Day and its no school day, he could wear his sandals to student care centre. I still can't believe it when we were heading off to school and we both were laughing at the "silly mistake that mum made". I was determined to wash one pair last Sunday morning, I grabbed a pair of shoes and marched off to the toilet. I still remember I was squatting in the toilet smiling to myself while scrubbing away thinking that FINALLY I am washing his shoes, he will have clean shoes to wear next week. I was feeling so proud of myself when I put them out to be sun dried at the balcony some 15mins later. I guess I was so determined to get the task done that I did not sense that there is anything wrong with the shoes in my hand. What am I going to do with 2 dirty left shoes and 2 clean right shoes? I can't let him wear them to school like that and I can't wash the dirty shoes now as they need at least 2 days to dry since the inside of the shoes are cushioned. Our balcony does not have direct strong sunlight, even if there is, its at different part of the balcony throughout the day as the Sun moves, no one will be at home to move the shoes around to catch the sun light. So what can I do? Lucky I've got a bottle of sneaker shampoo! A few wipes and the shoes are a little bit clean, not as clean as the ones I scrubbed but I guess have to make do this time. Now, I just have to find time to wash the other dirty shoe or which kind soul wants to volunteer to wash them for me? Cute. May you find a volunteer or the time. These days both are very hard to obtain. Good Luck and Thank you for sharing. One of the many adventures and you just gotta love these adventures right in your own house. 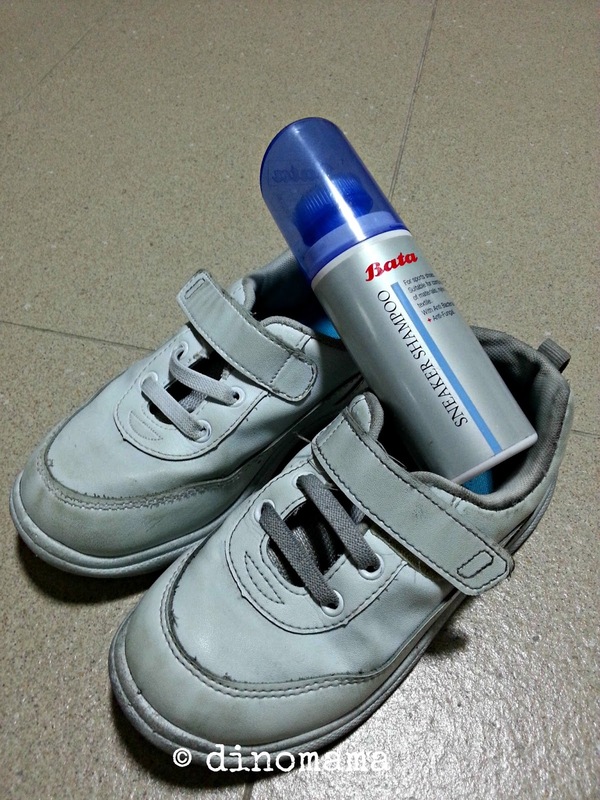 You are not the only person who forgotten and too busy to wash the stinky white turned black shoes. Me too during the June I totally forgotten about washing shoes. 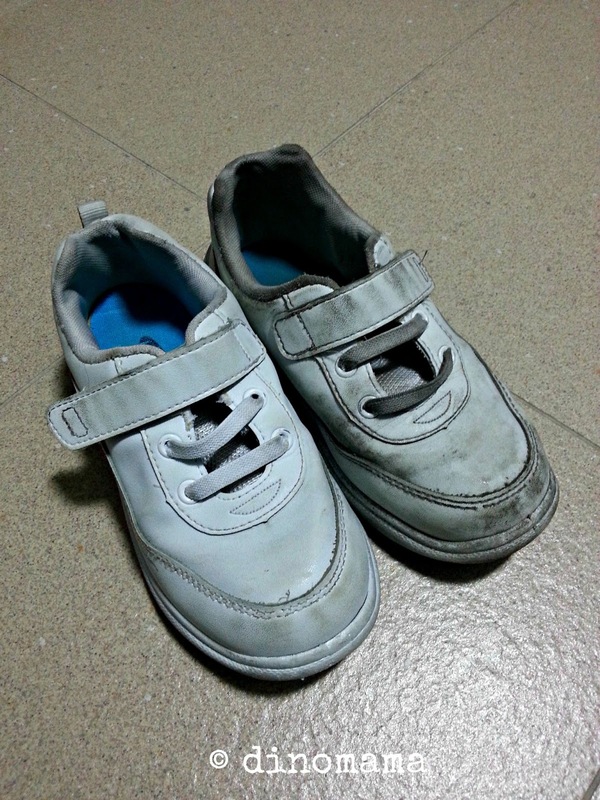 Not only June holiday even school days i can forget about washing shoes. So end up C have 3 pairs of shoes. Even when i am lazy or forgotten she still have a pair of cleaned shoes to wear. But each time i will spend an hour to scrub two pairs of shoes. erm the thought of washing school shoes....scares me... my children are still in the pre-primary stages. LOL this is soooooo funny la! I remember I used to use chalk to whiten my shoes and then whenever I stamped my feet, a huge white cloud would puff up! But that's only when I forgot to wash them. Had that little shoe brush too. First had to scrub with soap and then apply the white shoe 'paint' over. Wow. Memories! Yeah some clothes are very hard to clean specially my younger kid john's clothes.